CALLS: IIM LUCKNOW, IIM KOZHIKODE, SPJIMR(FINANCE), MDI GURGAON, XLRI, IIFT, IIM SHILLONG, NEW IIMS. 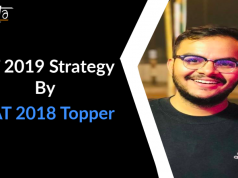 Having performed not so good in cat 2017 specially quants it was in July that I had a conversation with Indrajeet sir and since then sir has been motivating to perform well. 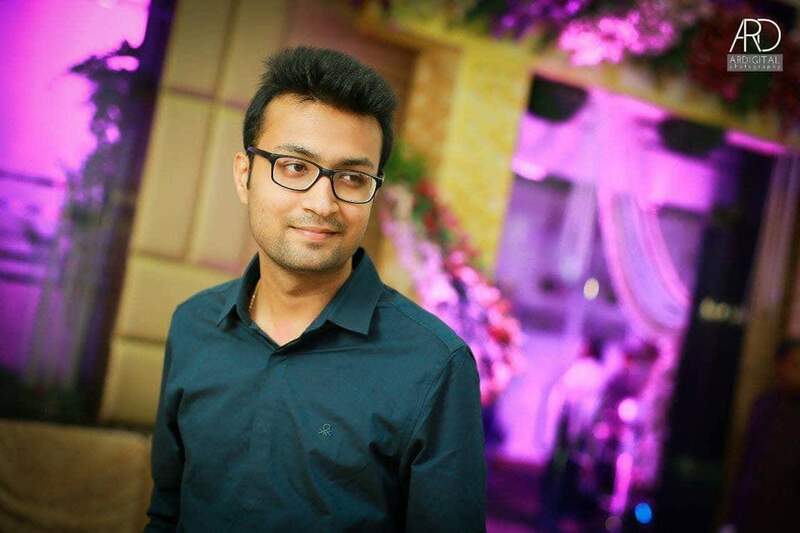 The classes were well planned and we had time for even attending revision classes in some topics. I also wanted to give my CFA level 1 along with CAT so attending classes at night and then studying for CFA was tough with my job but it all worked out well. 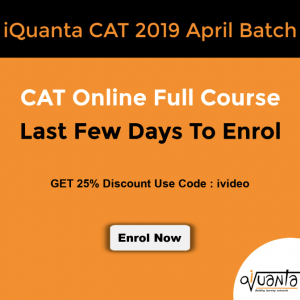 Being from a commerce background I was relatively weak in quants but surprisingly that went off very good in CAT with so much of daily practice ,doubt solving, the marathon classes and the mocks at iQuanta Classes. The best part of iQuanta classes is that everything remains the journey starting with the basic classes in July the syllabus was huge but it didn’t look as if I was behind. There was a lot of questions posted on the group after each classes and the class contained questions and explanations of every sub category topics. Now their were both shortcut and the traditional approach of every question mentioned or discussed about during class. I started with the mocks around September. Initially I was scoring in the range of 110-130 which I was disappointed about but as the things got covered in the class things improved. One main thing was to be well versed with topics that sir teaches. I had taken TIME mocks and iQuanta mocks. Just before Cat the crash course which is free for the existing full course students helped me a lot in revising concepts. 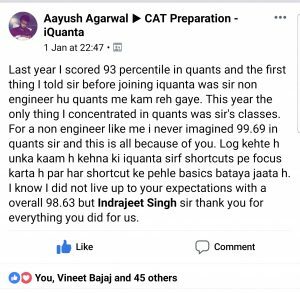 After CAT it was Mudit sir who guided me as a part of iQuanta GDPI classes and the interviews were well done according to me. Hoping for the best. At the end it is also about how much efforts you can put in. I feel the classes are enough for this. Just concentrated on the classes and the mocks. This section requires a lot if practice because it boils down to choosing the correct sets to attempt. Any standard coaching institute book along with the classes and mock would suffice. VARC: This section brought my percentile down and I believe only daily practice can make one excel in this section. 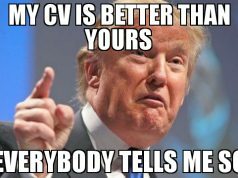 Next articleDoes your profile really matter? Does your profile really matter?